Evaluation of the dispersion and aggregation characteristics of particles is realized with a wide measurement range and in real time. Enables measurement of fine bubbles(micro bubbles from 100 nm to 60 μm) ,and allows real-time tracing of the changes in the bubble diameter. This system enables the evaluation of sub-visible particles included in biopharmaceuticals. Special options can be added to create an aggregation property evaluation system for biopharmaceuticals. Changes in particle size across the 7 nm to 800 μm measurement range can be continuously measured using a single light source, single optical system and single measurement principle. Since a primary particle and an aggregate and contaminant can be measured with one system, the aggregation properties by a dispersion condition can be checked. The evaluation of the dispersion and aggregation characteristics of the particles is realized with a wide measurement range and in real time. By incorporating a single light source, which does not require switching, and the wide-angle detection method, the measurement time can be reduced to a minimum of 1 second. In addition, the particle size distribution can be displayed in real time at 1-second intervals. Serial observations of the dispersion, cohesion or dissolution reaction processes are possible at 1-secondintervals, and these results can be saved. Functions for statistical processing and 3D display of the particle reaction processes offer multifaceted analyses and evaluations. Connecting the flow cell directly to the fine bubble generator enables in-line real-time monitoring of the changes in fine bubbles. 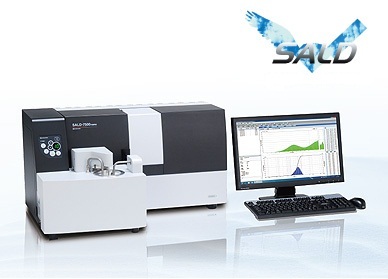 Compared to other instruments, the SALD-7500nano permits measurements across an extremely broad concentration range of 0.01 ppm to 20%. The particle size of fine particles, particularly nano particles, varies with the concentration. The dispersion and coagulation of nano particles can be observed while altering the concentration. Accurate analysis of samples in which the particle size distribution changes with dilution is possible, as measurements can be conducted on the undiluted solution or after minimal dilution. For example, commercial hand creams, face creams, and rinses can be measured with hardly any pretreatment. Drainage of a small quantity of a suspension liquid is adequate since the SALD-BC75 batch cell permits analysis of a volume of just 7 cm3. Most organic solvents can be used. A combination of the SALD-HC75 high-concentration sample measurement system with special glass slides featuring a shallow indentation permits measurement on just 15 micro liters.